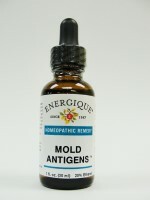 For temporary relief of allergies due to molds. Antigens of Alternaria, Aspergillus, A. Glauc., A. Nid., A. Fum., A. Niger, Blastomyces, Candida Krus., C. Parap., C. Pseud., C. Rug., C. Stell., C. Trop., C. Util., Clad. Spp., Crypto. Spp., Fusar. Mon., Trichophy., Epider. Spp., Penici. Ohyr., P. Ca., Mucier P1., Geotri. Spp., Mycosis, M. Or., Fungoides, Actinomyces, A. lsraelii, Trichos, Spp., Monila 4.b.. Curval Spp., Pullullaria Dig., P. Pull., Rhizo Nig. in 5x. 33x, and 203x dilutions with Pulsatilla Nigricans 12x, 15x, Sepia Succus 12x, 15x, Arsenicum Album 12x, 15x, csphows 12x, 15x as potentiators, Distilled Water and Ethanol.